Maccaferri’s GalMAC 4R metal coating solution increases the corrosion resistance of metal wire by four times in comparison to wires using heavy zinc reinforcement. Corrosion is the deterioration of metallic materials by chemical or electrochemical action. It can be associated with mechanical stresses and when found in metals like iron and steel, affects not only the aesthetic appearance of the material but also its mechanical strength and lifespan. When considering the use of metallic materials in engineering solutions for works, it is necessary that the infrastructure can resist the corrosive action medium, in addition to the required mechanical properties and suitable manufacturing processes. A crucial recent development in the way of metal coatings for wires (mainly for those used in the manufacturing of double twist hexagonal mesh) is the GalMac 4R. Thanks to its Physical and Chemical characteristic, it provides performance developments in the field of durability. It is specific to the range of hexagonal mesh double twist products. In the process of zinc (Zn) oxidation the proportion of aluminum (Al) ion the wire surface is increased, thus making the metal stiffer and more resistant to the effects of corrosion. The coating GalMac 4R also has the presence of Rare Earths “MischMetals” (MM) that allows a more authentic link between the Zinc (Zn) and Aluminum (Al). The product’s strengthening and enduring qualities become even more apparent when compared with heavy zinc coated wires. The comparison shows that GalMac 4R is up to four time more resistant to the effects of corrosion than its Zinc counterparts. The results are even more surprising when GalMac 4R coated wires are compared with lightly galvanized coated wires. 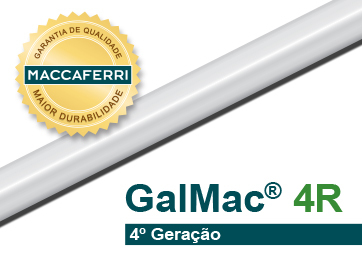 In this comparison, the GalMac 4R adds 12 times more resistance to the wires. In practice, this means more durable engineering solutions, lower maintenance costs and better technical and functional performances. The solution of Maccaferri is regulated by EN 10223-3 standards: 2013 (Hexagonal Steel Wire Mesh Products for Civil Engineering Proposes), ASTM B860 (Standard Specification for Zinc Master Alloys for Use in Hot Dip Galvanizing) and NBR 8964 (steel wires of low carbon, coated for gabions). The GalMac 4R coating can be applied to several Maccaferri products from the double hexagonal mesh twist portfolio. Such products include the gabion box, Reno mattress, gabion bag, Terramesh System, Terramesh Green, high-strength network, as well as the MacSoil, MacMat and SteelGrid product lines. For applications in water or chemically aggressive environments, products with hexagonal mesh must have an additional plastic coating to ensure full functionality. For more information, please contact us. For further details on the GalMac 4R read our technical document on the Spanish and Portuguese version.